Ransom Allen was the oldest son of Dock and Eliza (Williams) Allen. He was born free in Alabama about 1860. He and his 7 siblings grew up in Montgomery. He was my great grandmother Jennie’s older brother. His father was a carpenter. His mother was a seamstress. He became a barber. 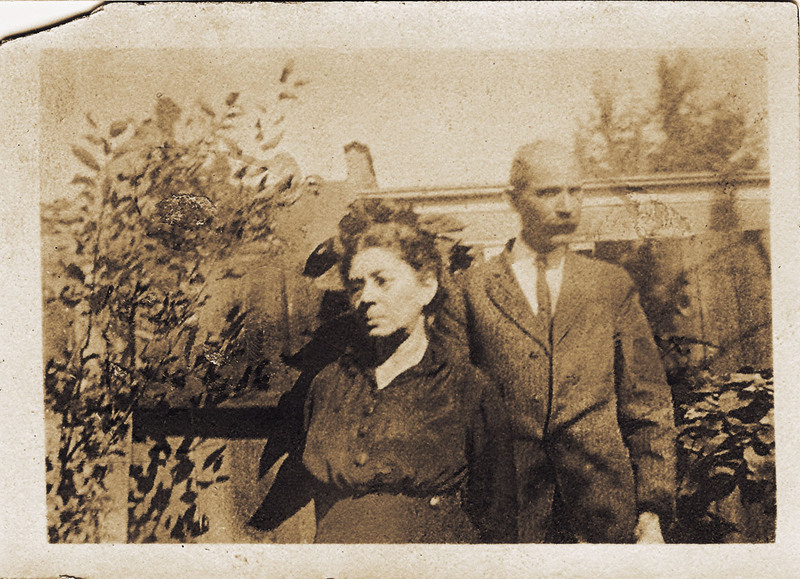 In 1883 Ransom married Callie Whitaker in Troup County, GA. I don’t know how or where they met, but she was born in Georgia. In 1888 their son, John Wesley, was born in Montgomery. John was the only one of their three children to survive childhood. The family relocated to Chicago, IL about 1917 where Ransom continued to barber and John worked as a Mechanic. John married Bobbie Conyer and their only son, Harold Thomas, was born in 1932 in Chicago, IL. In 1933 Ransom’s wife Callie died. The following year Ransom died at age 74. Their only grandson died in 1946 at 14 years of age. That was the end of Ransom’s branch of Dock and Eliza’s family. 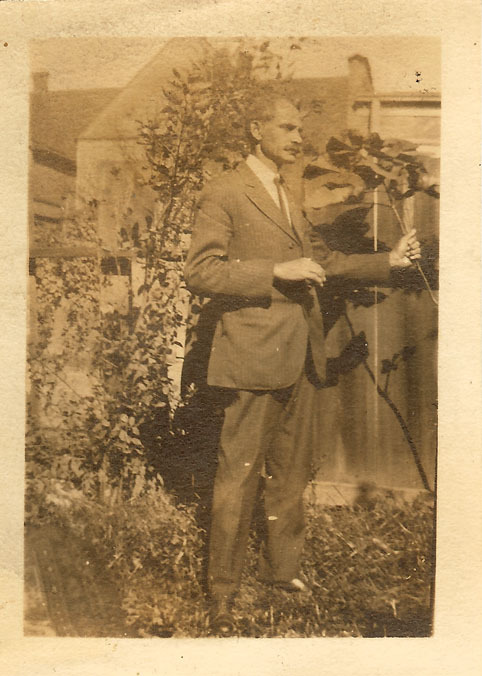 For more Sepia Saturday offerings with mustaches, Click! Very sad that only one child made it to adulthood – sign of the times I guess. I think it was. There were regular epidemics that swept through Montgomery during that time. A sad ending to a family line but two great old photos. As a barber in the 19th and early 20th centuries Ransom would certainly have an opinion about mustache and beard styling. The two photos look like they came from the same day. A special occasion like an anniversary maybe? There is a third photograph of him playing with a cat from the same day. Unfortunately, nobody wrote what the occasion was. Could have been after church, or a special occasion. Great moustache and as Mike says, Ransom would have known about styling. Cassie looks so sad and pensive in the second photo -and with good reason. I smiled at how Ransom’s occupation drew on the “cutting” skills of both parents. I hadn’t thought of that. I’d wondered if Dock Allen had wanted him to go into carpentry and how he decided to be a barber. Ransom looks a dapper gent! Those photos look rather formal….taken for a purpose? Off-topic slightly, but was “Randsom” a common Christian name back in the day? When doing research, I do come across others named Ransom. There are another few named Ransom Allen that come up in searches but they lived in other places so I know they aren’t mine. I wish I did know what the occasion of the photographs was. At first my reaction to hearing about the early death of the only son of the only son of your great-grand-uncle was sadness that that branch of the family died out. But then I thought about it differently. I thought of the rich tapestry of courageous lives of which your ancestor was a hardworking and upstanding member, his life during turbulent and changing times contributing a strand not only to your family but also to the legacy of his times, to sensibilities that have been passed down to us all. As a barber he must have heard a lot of stories, and probably passed some of them on as well. And as your family genealogist and a storyteller yourself, you have taken on the valuable role of preserving and passing on his story. What surprised me about the death of Ransom’s grandson was that he was 14 when he died. I had assumed he was an infant. He died the same year I was born. Dock and Eliza Allen had a younger son, also named Dock. My aunt told me once that he died ‘Walking the moonlight path” on a boat. When I found his death record he had died from drowning. I guess he had been drinking and tried to walk the moonlight path. He was in his 20s and didn’t leave a family. In all of the lines I’ve found, the male line seems to die out. So heartbreaking when a child dies young, before his parents. (At least Ransom and Callie Allen’s grandson died after their deaths.) It seems especially sad when they’ve survived infancy and are coming into their flower of youth. Walking the moonlight path: what a way to characterize a tragic death by drowning. Perhaps it also captured something of his nature. All those lines dying out. . . we’ve spoken of this before in other comments, that there is this strong sense of loss; and yet, nothing ever really dies in the sense that it all contributes to the endlessly-weaving fabric of life. It’s sad to see where and when a particular branch of the family ends. As I was reading through the comments, I saw your comment about male lines dying out. I am very glad their stories are being published, because without your blog, other relatives may not have known about them. What an interesting family history. I’m struck by the photos which bring to life these people, and your narrative which lets me know who lived where and how their lives moved forward. Each person’s existence is important, for what reason we may not know, but the story of their lives brings thoughts of how we all share this earth together. “Walking the moonlight path.” What an amazing expression; when I read it, I knew instantly what it meant — there IS a moonlight path, isn’t there? I know. That is such an accurate description. I’ve often seen it, but never walked. You know, your comments here add so much. I am glad to read them. I wonder why the male lines die out? In my family it was because none of my grandfather’s brother’s had sons who had sons. My father’s line is continuing through my sister and me but we had no brothers so, no Cleages. I heard the former slave holder Cleages also have no males after the old man dies. I agree with the previous comment about Ransom being a handsome man and the sadness of his line dying out. Some people are just unlucky in that regard, and even if they had a lot of children, there would be no certainty of survival back then. Dear Kristin– Thanks very much for your remembrance of Ransom Allen. Your work on bringing your family to light (and to life) is invaluable. The first photo is so striking — says so much about the man and how he sees himself and carries himself in the world. Powerful stuff, these photos. With the comments, yours and your commenters, I thought about how quickly lines dies out these days — not so much because of early deaths, but few children born to a family so it’s not only the male like that dies out, but the entire line can be gone in a couple of generations. Mind boggling.